BEST FIGHTER FOR CANADA: GRIPEN E FIRST FLIGHT! The Gripen E (née "Gripen NG") can no longer bed accused as being a "paper aircraft". 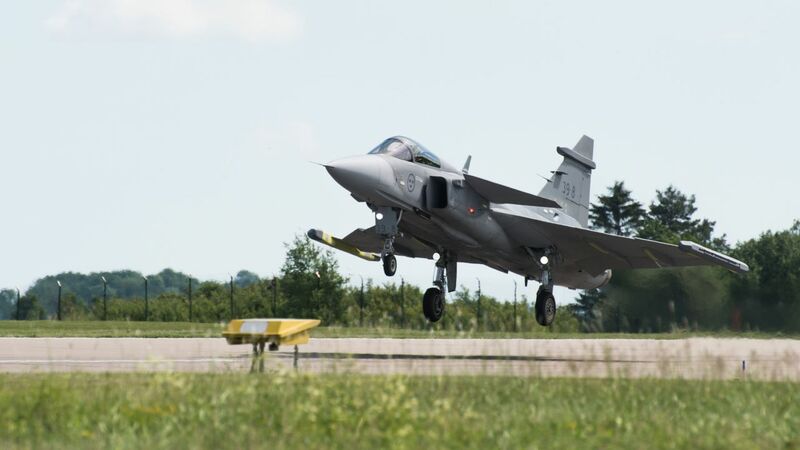 On June 15, Saab successfully flew its first JAS 39 Gripen E.
The flight went off pretty much on time, with Saab promising a flight in the second quarter of 2017. Initial plans were to hold the test flight in late 2016, but Saab chose to delay the flight due to self-imposed software requirements. Saab insists the aircraft is still on track for deliveries to begin in 2019. The upcoming years may indeed be the "perfect storm" for Gripen E sales success. Contemporaries like the Typhoon, Rafale, and Super Hornet have had middling sales success, but are not even close to representing a true sales rival to the F-35. Simply put, these fighters do not seem to offer enough of a cost and/or performance benefit to entice qualified buyers away from the still troubled JSF. But the Gripen E is different. Saab is promising the Gripen E will continue its predecessors' low operating costs as well as equipping cutting edge avionics and sensors. Saab is clearly marketing the Gripen as the most "fighter bang for the buck". Just the thing for a nation needing to rebuild its military on a budget, hmmm?